This weekend Forrest and I had the good fortune of being invited by our friend Gus to stay at his ski cabin for the MLK weekend. When we first started planning this trip I was mucho excited. I fun filled weekend in a rustic cabin, with a hot tub, and lots and lots of snow??? Can't get much better than that, right? Well, then "Winter Storm 2011" hit and I thought I might have to cry if I saw one more flake of snow! I was still excited, but there is only so much snow this Alabama girl can take! Not only were we excited to get to have a mini vacation, but we were also going to spend time with some great friends whom we hardly EVER get to see! Accompanying us on the trip were obviously Gus, our host, and his girlfriend Amy who I met at our wedding for all of 5 seconds. Gus and Forrest were fraternity brothers at Alabama. Also joining our group was Frankie, another fraternity brother, and his fiance Becka. Becka and Frankie met while in the Peace Corp in Togo, Africa. We were lucky enough to get to see them right after they got back to the states, in July 2009, but we have not seen them since then, because they moved to DC! Forrest and I were both ready for a little R and R as well as the 3rd R, REUNIONS!! Forrest's patient canceled on Friday afternoon so I left work early, rushed to get everything ready, and by the time he got home, we were all set to go. Since there was still snow on the ground, this made me very happy. I was a little nervous to be driving somewhere at night with icy roads, so being able to get out of town during the daylight was a pro to me. I was able to find my new book club book on CD at the library so Forrest and I listened to that for a while on the road. I am totally getting into these books on CD now, after being read to by Farrah all the way home from Orlando a few weeks ago. We also had a lot of fun with the iPod, picking out songs that reminded us of funny times in our lives. ALSO, we brought Ruffles with us! Gus insisted that she come so we could not resist. She was a very good girl in the car and basically slept on my lap the whole way there. The total drive up there took about 7 hours, which Forrest said is a little longer than usual, but we did get stuck in traffic a few times. We got there about the same time as Amy, Gus's girlfriend, so Gus was down at the bottom of the drive way with the 4 wheel drive car, ready to pick us and all of our stuff up to make the trek to the cabin. Frankie and Becka had beat us there and we had such a joyful reunion! Ruffles was excited that Amy had brought her two dachshunds, Millie and Annie, with her, and Becka, who has a strong case of doggie fever, was excited to get to love on all of them! After getting settled in, we all went to bed so we were ready for the next day. Frankie and Becka getting ready to ski. Frankie is a little scared! I was nervous to ski again, since I didn't have the best time doing it a few years ago in Colorado. Frankie had never skied before, and Forrest, Becka, and Gus were all pros. We decided that Gus would give Frankie and I lessons while Forrest and Becka hit the slopes on their own. I was amazed at how easily skiing came back to me. I wasn't great at it by any means, but at least I remembered how to steer and stop! Frankie was fearless and after a few minutes on the bunny hill he was ready for the lift. By this time, Becka and Forrest had skied several runs and decided to meet up with us. We all rode the lift to the top of the mountain to take an "intermediate" run down. Frankie and I were on the lift together and the guys in front of us both fell getting off. They were in our way and we didn't know what to do, so we just stayed on. I changed my mind really fast and jumped off from about a foot off the ground, but Frankie just stayed until he hit the kill switch and stopped the whole lift. He had to jump off from about 6 feet off the ground! What a way to start!! This sign was very appropriate. I wish Frankie had seen it BEFORE we got on the lift! Look at me go!!! Great form! We had a lot of fun skiing down the mountain together. I thought I did a pretty good job keeping up with the others and I only fell once when Forrest and I ended up getting our skies tangled up while we were standing around waiting on the rest of the group. 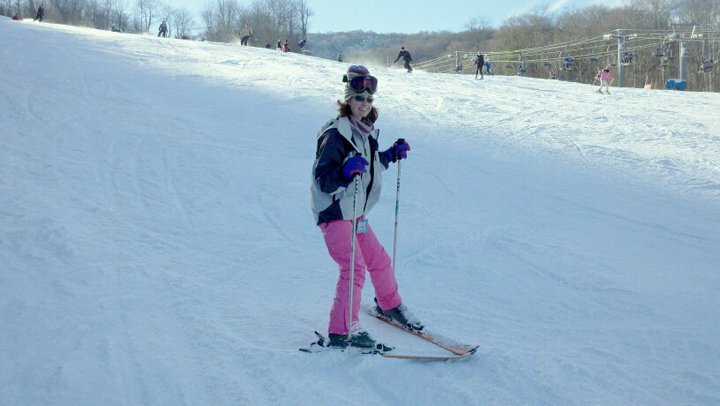 Frankie was the funniest beginner skier ever. He didn't really know how to stop or how to control his speed, so he just barrelled down the mountain and would fall over anytime he needed to stop. It made me pretty nervous but it was effective! After a great day of skiing, we headed back to the cabin. Amy had made some buffalo chicken dip for the weary skiers which we all pretty much inhaled before Becka made us some delightful turkey chili. I figure we probably burned off all of the calories skiing, right?? On Sunday morning we had breakfast casserole and then Forrest and I went to Mass at St. Elizabeth's. It was a cute little church that looked like a lodge. On either side of the altar were walls of windows that looked right up at the mountains. It was breathtaking! Boone is a college town and their mass reminded me of the masses in Tuscaloosa. They had a folk group, they played the same service music, and the priest, who was actually brand new, was very down to earth. When we got back from Mass, Amy had made us cheesy pigs in a blanket for lunch. Yummy!!! Then, she and I decided to hit the outlets and OMG I am so glad we did. Gap had all of their clearance priced items for an extra 40% off! I ended up getting 3 sweaters for me and a pair of dress pants ($4.19), and a polo ($3.59) and 2 pairs of pj pants for Forrest, all for $37! Hot dog!!! Next we went to JCREW, where I scored a pair of patterned tights for $3. My greatest purchase of the day came at Coach, where I got a gorgeous brown and purple purse for $77! It is the perfect size and most of all, the perfect color! Mrs. Bailey gave me some money for my birthday and I was happy to turn that over to the fine people at Coach in exchange for the perfect purse!! When we got home Amy and I had to show off our bargains to the rest of the group. Becka and Frankie were so impressed, they decided to check them out for themselves! In the meantime, Forrest and Gus had decided to go night skiing, and they talked me into going too. 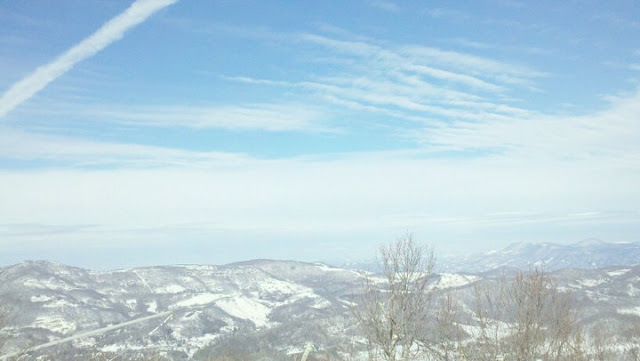 This time, we went to Ski Beech. We suited up and took the lift to the top of the mountain, where Gus and Forrest took a black slope down and I took a blue. May I just say this blue was basically black. Since it was night, everything had refrozen so I was basically sliding down ice. I HATED it. It was also super steep and I basically fell all the way down until it met up to the green run to the bottom. Forrest decided we should do it again and this time he would go with me so I could follow him. I liked that idea so I agreed, however, it was not a good decision. The run was just way to hard for me and I had a hard time getting down again. When I got to the green run Forrest was waiting on me and I had a total melt down. I was literally wailing out on the slopes (yes, muy embarrassing)! I had gotten really scared and just wanted to stop. Forrest was super encouraging and we got down the easy run together and I took a little ski break. Afterwards we decided to avoid that nasty slope and to ski some others. I got my stride back and we had a great time for the rest of the night. Forrest even tried a little ski jump and he totally landed it! I was so proud!! After a fun night, the 3 of us left the "Beech" totally frozen but all in all we had a great time! Back at the house, everyone was munching on the roast I had left in the crock pot, which I am happy to say they loved, and watching the Golden Globes (which I am sad I missed!). Then we all got in the hot tub and told funny Lambda Chi stories into the night. I was the only girl who knew the guys in college so I had lots of tales to tell! After we reluctantly got out of the hot tub we roasted marshmallows in front of the fire. What a fun night! It was SO much fun laughing, telling jokes and stories, and just being with one another! Thank you Gus for a GREAT weekend! I hope we can do it again soon!